Note: vaiyadhikaraNyam means two or more aspects having different substratum. For example, a chair may be held by the earth and a flower pot may be held by a table. It also means two or more words that are focussed on explaining different entities. It is explained that bhagavAn is the object of all worshipable aspects. It is explained that everything is sustained by emperumAn. Subsequently, emperumAn sustaining everything in the form of protection is explained through vaiyadhikaraNyam (that he is the one who is related to all different entities). Sustenance (of everything) is also under the disposal of bhagavAn through vaiyadhikaraNyam. nammAzhwAr says sthithi (sustenance) is also under emperumAn‘s disposal Just like the true nature is (explained in previous pAsuram). A person may control a house. Another person may control a village. Another may control a crowd. Another person (indhra) may control 3 worlds (bhUr, bhUva:, suva:). Another person (brahmA) may control 14 worlds (from brahma lOkam to pAthALa lOkam). Irrespective of the person protecting a house or the 14 worlds, it is because of bhagavAn being the antharAthmA (in-dwelling soul) they are able to protect and they get protected. Without his presence, no one will have the independant ability to control/protect anything. This is explained in vishNu purANam “nahi pAlanasAmarthyam ruthE sarvEswaram harim” (Other than the supreme lord hari, no one has the (natural) ability to protect others). As explained in thaiththirIya upanishath “yadhvEdhAdhau svara: prOkthO vEdhAnthE cha prathishtitha:” – whatever is created from bhagavAn during srushti (creation) will settle back into bhagavAn himself during layam (devolution), just like jewels are taken out of a jewel box, worn and then placed back in the jewel box. That praNavam, which has akAram as the first letter indicates bhagavAn as the rakshaka (protector). That bhagavAn is the sarvEswaran – supreme lord. Different adhikAris (qualified persons) based on their level of knowledge take shelter of different dhEvathAs according to their desire assuming them as their master who will fulfill their desires. It is appropriate for those dhEvathAs to be the ones who fulfill those desires. But, it is bhagavAn who is the master of everyone who stays as the antharAthmA (in-dwelling soul) of those dhEvathAs, ensures that such persons who desires for certain goals get their goals fulfilled according to their karmA. avaravar vidhivazhi adaiya ninRanar is also explained as follows. 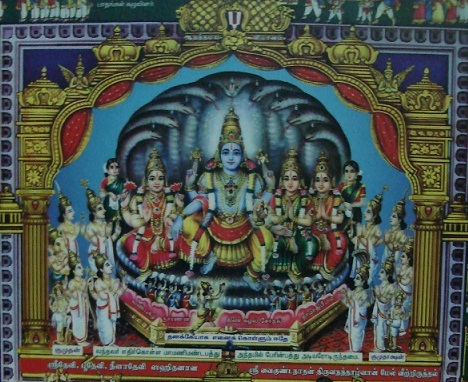 emperumAn is present as the antharAthmA of those dhEvathAs can take shelter of emperumAn (as explained in sAsthram) to fulfill the desires of their devotees. Persons worship indhra, etc., through jyOthishtOmam, etc, according to their gyAnam considering them as their benefactor. Those dhEvathAs are quite capable of fulfilling the desires of such persons who worship them as applicable for such worship. How is this possible? By following the principles of sAsthram, if a dhEvathA is worshiped, bhagavAn being the antharyAmi of those dhEvathAs, he facilitates the fulfillment of such results as he is the real object of worship. Many pramANams from bhagavath gIthA, etc., are highlighted to establish this principle. Since emperumAn, being the antharAthmA of everything, is the true object of worship and the true benefactor of all fruits, protecting everything is also under his full disposal. avaravar is explained as individuals who are different based on their guNam (quality) of sathvam (goodness), rajas (passion) and thamas (ignorance). avaravar – In thamizh “avaravar” when casually said indicates “someone” (that means, not so important persons). nampiLLai explains that AzhwAr does not give much importance to such worshippers of other dhEvathAs. It also indicates different types of persons. thamathamathu – their goals which are different based on their quality (sathvam, rajas, thamas). aRivaRi – the gyAnam (knowledge) which leads to such goals. Based on the guNam, one has ruchi (taste/desire) for the goals and such desire will lead to the particular means to attain such goals. An individual may be filled with rajO guNam (passion) or filled with thamO guNam (ignorance, lethargy, etc) or misra sathvam (tainted sathvam – since sudhdha sathvam is very rare to see) – so their gyAnam will also be in the same mode. 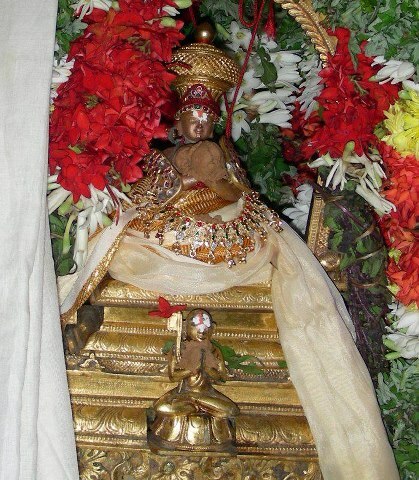 avaravar iRaiyavar ena adi adivargaL – Those dhEvathAs are very difficult to worship and please. In some cases, they (rudhran) insisted to their devotees to kill their own son and bring the flesh, (skandhan) insisted his devotee to bring the flesh of a goat, etc. But to please bhagavAn, just an anjali (namaskAram – folded hands) is sufficient as explained in bharathwAja samhithai “anjali: paramA mudhrA kshipiram dhEvaprasAdhinI” (anjali is the ultimate act which induces the blessings of bhagavAn). nammAzhwAr says “adi adaivargaL” (will take shelter of lotus feet) as he is used to that in his group (of AzhwArs). When sugrIva did not help srI rAma and lakshmaNa as promised, lakshmaNa came and gave a huge roar and created fear in the hearts of sugrIva. At that sugrIva asked hanumAn what to do and hanumAn said just perform an anjali and that will please lakshmaNa (and srI rAma too). avaravar iRaiyavar kuRaivilar – the ones who are worshiping are doing according to their nature and the ones who are worshiped are being the benefactor according to their nature – everything is appropriate according to their situation. iRaiyavar – Since bhagavAn is the supreme god for the worshippers, the dhEvathAs and nammAzhwAr himself as explained in nArAyaNa sUktham “pathim visvasya” (master of everyone). As explained in bhagavath gIthA by bhagavAn himself, whoever worships other dhEvathAs with bhakthi will reach such dhEvathA and get their desires fulfilled. When a son gets angry with his mother and leaves home, the mother will try to help him through others. Similarly, when jIvAthmAs are not mature enough to worship srIman nArAyaNan directly, he will help them through the dhEvathAs whom he have himself appointed. It is because of his existence, they are able to approach such dhEvathAs and such dhEvathAs are able to protect them. If he does not allow that, these dhEvathAs are as good as a straw-man who stands protecting the fields. This entry was posted in thiruvAimozhi, thiruvAimozhi 1st centum on March 31, 2015 by Sarathy Thothathri. In this pAsuram, the material realm which is fully owned/controlled by bhagavAn who is distinct from all other entities is explained. In this pAsuram, the material realm which is present for the sport of bhagavAn who is explained in the first pAsuram as the master of nithya vibhUthi (paramapadham – spiritual realm) is explained. 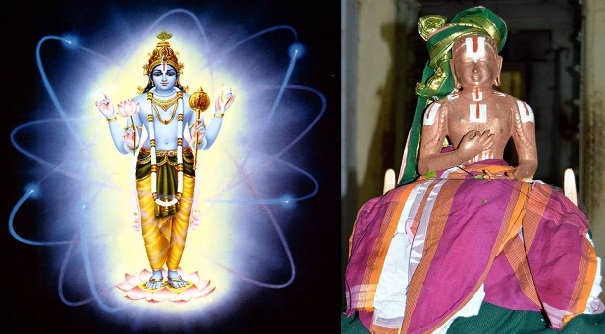 nammAzhwAr explains bhagavAn‘s connection with material realm to establish that he is not limited by any particular object or location. nammAzhwAr enjoys bhagavAn‘s auspicious qualities, bhagavAn‘s control over spiritual realm and his divine form (lotus feet) in the first pAsuram. In the second pAsuram, he explained the true nature of bhagavAn being totally distinct from chith and achith. In continuing with that, he is explaining the material realm which is also belonging to bhagavAn. Though, chAndhOgya upanishath declares “nOpajanam smarannidham sarIram” (a mukthAthmA, after being liberated, will never contemplate about this material realm since he will be fully engaged in blissful activities in spiritual realm), mukthAthmAs would still relish material realm as something that exists for the sport of bhagavAn. AzhwAr too, even though being present in this realm only, since he is blessed by bhagavAn himself with blemishless knowledge, he relishes this world as the wealth of bhagavAn. Just like a king and his wife may be engaged in making a garden and destroying it playfully even though they may have huge wealth (lands, palaces, etc), when srIman nArAyaNan and srI mahAlakshmi glances with their divine vision this material realm becomes manifested and when they glance away, the material realm becomes subtle. AzhwAr is enjoying such material realm in this pAsuram. bhagavAn cannot be understood by limiting him to certain objects only saying “since he is far-away from such object he is not present in it” and “since he is nearby to this object he is present in it”. 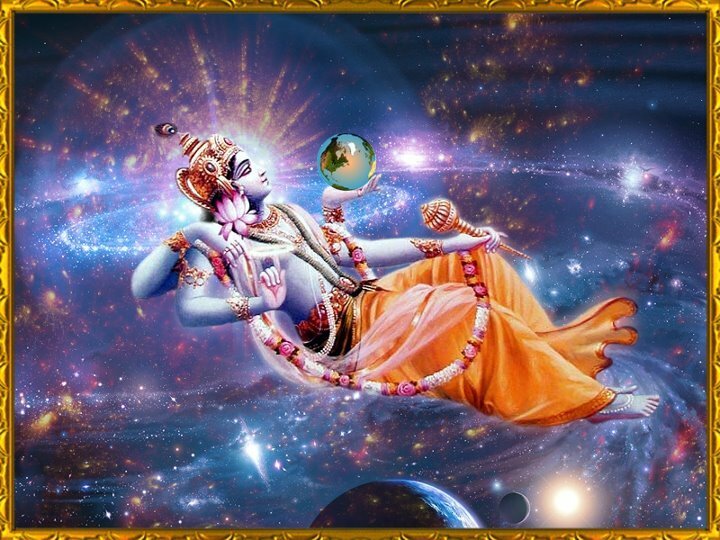 He owns all chith (which are not visible to external senses) and achith (which are visible to external senses) in both the lower and higher realms (earth and sky). He thus exists pervading everywhere having chith and achith as his attributes. We are blessed to take refuge of the most distinct bhagavAn who is filled with such auspicious qualities. In the first two lines, bhagavAn‘s vasthu parichchEdha rAhithyam (not limited by any object) is explained. In the next two lines, through the vyApthi (all pervading nature), his dhEsa parichchEdha rAhithyam (not limited by any place) is explained. 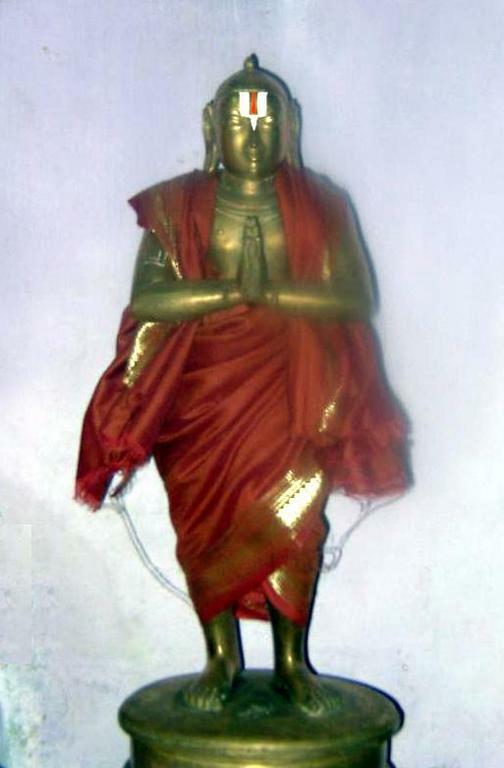 Thus his connection with lIlA (leelA) vibhUthi (material realm) is explained in this pAsuram. We are fortunate to receive the shelter of bhagavAn who is the master of everything/everyone, who is the in-dwelling soul of entire existence, one who is not touched by the defects of chith and achith, who is having full control over everything being the in-dwelling soul and who is distinct from everything else that exist. AzhwAr tells his mind to worship such emperumAn and be uplifted. ilanathu udaiyanathu en ninaivariyavan – It is easy to understand when it is said that “bhagavAn cannot be be explained as not having/owning this object” since he owns everything. But why can not we say “bhagavAn cannot be explained as having/owning this object”? If we said “x person has this”, then immediately a thought may arise “x person may not have this other thing” – to avoid such confusion bhagavAn cannot be explained as having one particular object. Either way, one may misunderstand the vastness (infinite nature) of bhagavAn‘s wealth. nilanidai visumbidai … – Then how do we explain his wealth? It has to be done as done in sAsthram – nArAyaNa sUktham say “pathim visvasya” (he is the owner of the entire existence). “nilan” (earth) indicates upto pAthALam (lowest in a particular aNdam – universe) and “visumbu” (sky) indicates upto the border of paramapadham. uruvinan aruvinan – Does “inan” in thamzh mean ownership? Yes, as explained in thiruvAimozhi 9.3.1 “kArAyina kALananmEniyinan” (bhagavAn has cloud-like beautiful dark-hued body), “inan” will indicate ownership. pulanodu – Would such emperumAn just stay in paramapadham enjoying endless bliss? No, he will exist inside everyone and protect them as the in-dwelling soul. He performs creation (subtle to gross manifestation), enters into all manifested matter through jIvAthmAs and thus present as the in-dwelling soul of everything that is manifested. pulanalan – If he exists with them, will he be affected by the defects of achith (like complete transformation of state) and chith (like having joy and happiness based on karmA)? No, this principle is explained in rig vEdham “dhvA suparNA sayujA sakhAyA samAnam vruksham parishasvajAthE | thayOranya: pippalam svAdhvaththi anaSnannanyO abichAkasIthi ||” (There are two related (servant and master) birds (jIvAthmA and paramAthmA) residing in a tree (body). One bird (jIvAthmA) enjoys the fruits of its actions (karmA) and the other one (paramAthmA) being detached is radiantly witnessing that). naNuginam – Not just being blessed by bhagavAn with blemishless knowledge, I have also taken shelter of him. nAmE – Instead of saying “nAm”, AzhwAr is saying “nAmE!” with exclamation. AzhwAr doubts if he has really taken shelter of bhagavAn. Considering how materialistic he was before being blessed by bhagavAn, he cannot believe his fortune. When sIthA pirAtti was in agony in asOka vanam at lankA, she saw hanuman singing the glories of srI rAma and became very confused and could not believe what was happening. She questioned herself if it was her own bewilderment or madness or is this a wicket dream (srI rAmAyaNam sundhara kANtam 34.23). Before, AzhwAr was thinking “IswarOham” – aham should lead upto Iswara, but AzhwAr was considering his body as AthmA/Iswara before being blessed by bhagavAn with blemishless knowledge. When bharathAzhwAn went looking for srIrAma to srI bharadhwAja rishi’s Asram, he was thinking himself “Am I truly entering the Asram here to see srI rAma? I am the most unfortunate person to have been called “Oh! king” by kaikEyi when srI rAma was the real king and was doubted by guhap perumAL that I was coming to hurt srI rAma further. How is this happening?”. This entry was posted in thiruvAimozhi, thiruvAimozhi 1st centum on March 24, 2015 by Sarathy Thothathri. The most distinct nature of bhagavAn‘s svarUpam (true nature) which is the abode of the previously mentioned auspicious qualities is explained in this pAsuram. Such bhagavath svarUpam is explained as the opposite of all blemishes and the abode of all auspiciousness. Very similar to piLLAn‘s introduction. Such bhagavAn‘s svarUpam is explained in a step-by-step manner. Next, nammAzhwAr speaks about bhagavAn (who is explained as “yavan” in previous pAsuram) being distinct from all other entities. Previously, bhagavAn who is explained as “yavan” is further elaborated as distinct from all other entities and is made of gyAnam (knowledge) and Anandham (bliss). This is explained in a step-by-step manner. bhagavAn can be explained by explaining the result (this universe) first and then explaining the cause like it is done in thaiththirIya upanishath “yathO vA imAni…“. He can also be explained by explaining his svarUpam first and then his wealth, etc. But AzhwAr chooses to explain the auspicious qualities first and then bhagavAn‘s svarUpam subsequently. This is because bhagavAn attracted him by revealing his qualities to AzhwAr. Thus AzhwAr spoke about his qualities first. He simply stated the glorious nature of bhagavath svarUpam which is the abode of such qualities using the term “avan”. Here, he enjoys that svarUpam being most distinct due to him being distinct from all chEthanam (sentients) and achEthanam (insentients) as he is opposite of all blemishes/defects and the abode of all auspiciousness. இனனிலன், னெனனுயிர், மிகு நரை யிலனே. bhagavAn is immeasurable by even well-blossomed mind which is free of blemishes such as kAmam, krOdham, etc., that can understand the AthmA. He is immeasurable by the external senses which are used to comprehend achith (matter). Thus he is distinct from both chith and achith. He is identified as full knowledge and full bliss and has none who is equal or higher in the past, present or future. He is my sustaining soul. In all the 10 pAsurams, “avan thuyaraRu sudaradi thozhudhezhu” (worship such bhagavAnand be uplifted) should be added in the end. This pAsuram explains sOdhaka vAkyam (that statement which analyses bhagavAn‘s true nature) – “sathyam gyAnam anantham brahma” i.e., sathyam – most distinct in nature, gyAnam – being full knowledge and bliss, anantham – not having anyone equal/higher in past/present/future. First “inan” explains his greatness. Subsequent “inanilan” explains that there is none comparable to him. Very similar to the simple translation. AzhwAr says to his mind that such bhagavAn should be worshipped (linking this with the last line of the 1st pAsuram). When it is sufficient to say that bhagavAn is different from all jIvAthmAs, why is it necessary to establish that he is different from achith (matter)? This is to establish that – looking at him, it is irrelevant whether it is chith (sentients) or achith (insentients) – none can match him. It is already explained that bhagavAn is distinct (greater) than every one/thing? What is the need for saying there is none equal/higher than him in past/present/future? This is to expain that no one is even qualified to compared with him (let alone be compared). This reflects nampiLLai‘s vyAkyAnam mostly. mananagam… – nampiLLai questions the need for explaining about jIvAthmA in detail? This is AzhwAr‘s real experience of his own self/heart being most purified (by bhagavAn‘s mercy). malamaRa – blemishes in the heart/mind are avidhyA, etc. kAmam (lust), krOdham (anger), lObam (desire for material aspects), harsha (happiness), mAnamathA guNA: (ahankAram, pride and lack of good qualities), vishAdham (sorrow) are the eight defects for the mind. But since AthmA is eternal and is fully knowledgable naturally, these defects are not natural for the mind (since mind also gets subdued during praLaya). Thus by following yOga sAsthram, removing the detachment from external worldly pleasures and turning it inwards towards the AthmA, these defects can be removed. Here the mind is explained as the tool through which AthmA can be understood. But one may question, just like gold and charcoal may be different, they can be perceived by the same senses, why can’t bhagavAn be perceived by mind which perceives AthmA? That cannot be applied here due to the infinite greatness of bhagavAn. But then, why is it said that “…manasA thu visudhdhEna” (such bhagavAn is perceived by the pure mind). That means, bhagavAn can be understood that he is supreme/great – but he cannot be fully understood as he is, due to his infinite greatness. uNarmuzhunalam – fully made of knowledge and bliss. As explained in bruhadhAraNyaka upanishath explains “yathA saindhavagana:” (like a salt crystal is filled with salt, bhagavAn is filled with knowledge). thaiththirIya upanishath says “AnandhO brahma” (brahmam is bliss) and “Anandha maya:” (pervaded by Anandham). He can only be understood through examples – even those examples, he cannot be fully comprehended. inanilan – bhattar highlights that “First AzhwAr says that there is no sAdharmya dhrustAntham, here he says that there is no vaidharmya dhrustAntham“. That means first it is explained that bhagavAn cannot be compared to chith and achith. Here it is said that there is no one who is even qualified to be compared to bhagavAn. kAnchIpuram PB aNNangarAchAryar swamy gives a nice example for this in his dhivyArtha dhIpikai. He says if some one says “A chaNdALa (dog-eater) cannot be compared to vasishta (famous sage)”, learned persons will say “No! dont say that”. That does not mean that they are comparable. It simply means that chaNdALa is not even qualified to be compared to vasishta. enanuyir – Such bhagavAn is my sustenance. Like it is said in bruhadhAraNyaka upanishath “yasya AthmA sarIram” (bhagavAn is antharyAmi for the AthmA and the AthmA is the sarIram – body). bhagavAn is the dhAraka (bearer) and AthmA is the dhArya (held by bhagavAn). migunaraiyilanE – Just like him being the antharyAmi and bearing/controlling the jIvAthmAs, there is no one else who is his antharyAmi and greater than him. This is explained in svEthAsvathara upanishath “na thathsamascha abhyadhikascha dhrusyathE” (No one equal or higher to that bhagavAn is seen). This entry was posted in thiruvAimozhi, thiruvAimozhi 1st centum on March 23, 2015 by Sarathy Thothathri. nammAzhwAr enjoys the most glorious bhagavAn fully and out of great devotion caused by such experience, reveals his experience to others. bhagavAn srIman nArAyaNan who is opposite to all defects and the abode of all auspicious qualities, being the master of nithyasUris (in paramapadham, out of his unconditional grace, blessed nammAzhwAr with pristine knowledge and devotion towards him. Being blessed, nammAzhwAr starts engaging in service of such bhagavAn. Thus, at the beginning of the prabandham itself, (auspicious aspects such as ) the object of glorification and reverential bowing down are highlighted. In this pAsuram, the summary of the first padhigam (decad) is explained. In this first pAsuram, the existence of unlimited auspicious qualities, unconditional mercy, controlling the nithyasUris and having eternal auspicious forms – all of these which reveal the supremacy of emperumAn is revealed. Having said so, nammAzhwAr directs his heart to always serve such emperumAn. Very similar to nanjIyar‘s introduction. nammAzhwAr first highlights the 3 main favours that are done by emperumAn towards him. First emperumAn favoured AzhwAr by showing his true nature of being filled with auspicious qualities. Then, even though AzhwAr did not have anything on his side, emperumAn blessed him with divine knowledge and devotion towards him out of his causeless mercy. Then he showed that he is the master of nithyasUris. Being favoured like this, AzhwAr directs his heart to come and serve him eternally. AzhwAr asks his heart to bow down to bhagavAn to be uplifted. Just like when a river starts flooding nearby fields, the trees which stay still will be uprooted but the plants, etc., which bend and tackle the flood will survive, after understanding the glories of bhagavAn, if one bows down in front of him, he will be uplifted. Just like lakshmaNa said he is overwhelmed with srI rAma’s auspicious qualities and became a servant to him, AzhwAr also reveals his attachment towards emperumAn and thus becoming a servant to him. Since, bhagavAn showed his auspicious qualities to AzhwAr to win over him, AzhwAr too engages in glorifiying bhagavAn‘s auspicious qualities right in the beginning. en mananE – oh my mind! Oh my mind! Bow down with folded hands at the lotus feet of emperumAn and be uplifted. emperumAn is the famous one highlighted in authentic scriptures who has unexplainable greatness which makes all other greatness non-existing. He is the one who blessed me out of his unconditional grace that dispelled my ignorance completely. 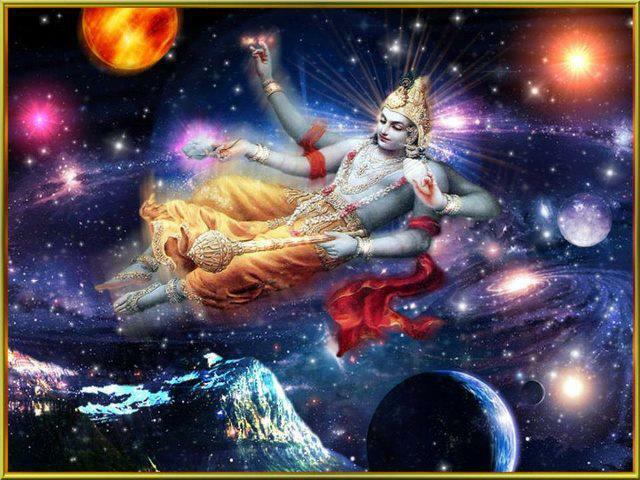 He is the undisputable master of the nithyasUris who have no defects such as forgetful nature, etc. In the first line, “nalam” indicates the unlimited bliss or those auspicious qualities that lead to the unlimited bliss of bhagavAn . In the second line, “nalam” indicates devotional friendship with bhagavAn. Each line ending with “avan” in the end is joined with the last line and explained as well. i.e., Oh mind! bow down at the lotus feet of the one who is filled with auspicious qualities and be uplifted. Oh mind! bow down at the one lotus feet of the who bestowed me true knowledge and devotion and be uplifted. Oh mind! bow down at the one lotus feet of the who is the master of nithyasUris and be uplifted. Also, this pAsuram reveals the essence of thirumanthram. praNavam which reveals the master-servant relationship between paramAthmA and jIvAthmA is explained in first line as it explains bhagavAn being supreme to everyone, nama: – him being upAyam is explained by the second line as it explains bhagavAn bestowing true knowledge/devotion to AzhwAr and finally nArAyaNAya is explained the 3rd and 4th lines – the ultimate goal of paramapadham (3rd line) and kainkaryam (4th line). AzhwAr instructs his mind to engage in all types of kainkaryam at all places in all ways to bhagavAn and be uplifted. bhagavAn is explained as having unlimited auspicious qualities such as bliss, etc. He, unconditionally and mercifully blessed AzhwAr with divine blemishless knowledge and triggered great devotion towards his lotus feet. bhagavAn is explained as the master of the infiinte divine souls in paramapadham such as Adhi sEshan, vishwaksEnar, garudAzhwAr, etc., who never fall from their position and already showering his towards such nithyasUris. uyarvaRa uyarnalam udaiyavan – Just like in the presence of Sun, the stars do not shine, in comparison to bhagavAn‘s glories, others’ glories do not shine at all. madhinalam – bhakthirUpApanna gyAnam – knowledge enriched with devotion or knowledge matured into devotion. amarargaL – usage of plural indicates there is infinite nithyasUris. thuyaraRu sudaradi – Is there agony for the lotus feet themselves? Yes – they consider the agony of the ones who are surrendered as their own and removes that agony. Why is AzhwAr asking to worship the lotus feet instead of bhagavAn himself? Just like a breast-feeding child will look for the mother’s breasts, adiyavan (dhAsa – servitor) will look for the lotus feet of the master. Many arguments such as “brahmam is sath only without any attributes” (auspicious qualities in the first line) and “the difference between jIvAthmA and paramAthmA is artificial, on liberation they will become one” (master of nithyasUris explained in the third line) are defeated easily and AzhwAr‘s sidhdhAntham is established. amararagaL – ones who are immortal. For them death means separation from bhagavAn – there is no other death for them. uyaravaRa uyarnalam – When thaiththirIya upanishath started enjoying bhagavAn‘s auspicious qualities, it could not even fully enjoy a single quality named “Anandham” (bliss) and declared “yathO vAchO nivarthanthE“. Each quality of emperumAn is infinitely great. ALavandhAr explains that bhagavAn‘s greatness over all other entities is clearly explained here. udaiyavan – These qualities are natural for bhagavAn instead of being accidental (acquired). kUraththAzhwAn explains to piLLai piLLai AzhwAn that AzhwAr establishes bhagavAn‘s auspicious qualities right upfront and easily defeats the ones who claim he is nirguNam (without any qualities – according to them). yavan – that most famous and established personality. The personality on whom these auspicious qualities are naturally and fittingly visible. This means bhagavAn by nature is great and does not depend on his qualities to prove his greatness. On the other hand, this also means that bhagavAn who is with such great auspicious qualities. gyAna anudhaya (no knowledge at all) – dhEhAthma abhimAnam – considering body as the soul. This means, there is no knowledge about jIvAthmA and considering the body itself as everything. anyathA gyAnam – dhEvathAnthara sEshathvam – considering oneself as servitor of other dhEvathAs such as brahmA, rudhran, indhran, etc. viparIdha gyAnam – svAthathriyam (considering oneself as independant) and svabhOgyam (considering oneself as the enjoyer) like kEvalan (one who desires kaivalya mOksham). madhinalam – some explains this as gyAnam and bhakthi. But bhattar explains this as gyAnam enriched with bhakthi (gyAnam matured as bhakthi). This bhakthi was blessed by bhagavAn himself and it induces kainkaryam to bhagavAn. When some ask embAr if AzhwAr was a prapanna or bhakthi yOga nishta? He replies “AzhwAr is a prapanna; but performs bhakthi to spend his time in this world”. 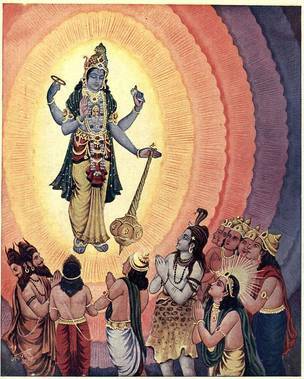 aruLinan – Being blessed by bhagavAn unconditionally, he considers himself as asath (insentient) before being blessed. amarargaL – the residents of paramapadham who cannot bear separation from bhagavAn. All of them look similar to bhagavAn – only in the grand assembly and by seeing his divine consorts and divine ornaments like srI kausthubam he can be easily identified. adhipathi – Though there are some similarities, he is completely greater than them. thuyaraRu – Previously AchAryas explained this as “thuyaraRukkum” (that which dispels the agony of others). emperumAnAr explained this as “thuyaraRu sudaradi” (the lotus feet which dispels the agony of bhagavAn). As explained in srI rAmAyaNam ayOdhyA kANtam 2.42 “vyasanEshu cha manushyANAm brusam bhavathi dhukkitha:” (when his subjects suffered, srI rAma felt more agony than themselves) bhagavAn was in pain seeing AzhwAr‘s sufferings before, but seeing he has been blessed, his agony is dispelled. thozhudhu – engaging in the devotional activity which is natural for the jIvAthmA considering the time lost in this samsAram since time immemorial. ezhu – rise and be uplifted. 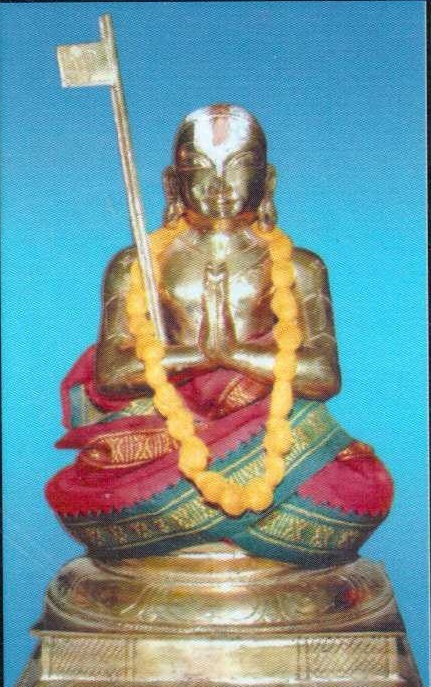 From the state of “asannEva sa bhavathi” (thaiththirIya upanishath Anandhavalli – he is not even considered to be existing when he considers brahmam to be not existing), he became “santhamEnam thathO vidhu:” (thaiththirIya upanishath Anandhavalli – others know him to be existing when knows brahmam to be existing). en mananE – now only AzhwAr is seeing himself. He relishes his relationship with his mind now having been blessed by bhagavAn. As explained in srIvishNu purANam 6.7.28 “mana Eva manushyANAm kAraNam bandhamOkshayO:” (For a man, his mind is the cause for both attachment in this world and liberation from this world). Ones who claim that bhagavAn does not have guNam (qualities), vigraham (form), vibhUthi (wealth) are all defeated in this pAsuram itself. One need not explain the opponents case and defeat it. If ones own philosophy is explained clearly, that will easily defeat the opponents philosophy. artha panchakam is explained in this pAsuram. This entry was posted in thiruvAimozhi, thiruvAimozhi 1st centum on March 21, 2015 by Sarathy Thothathri. Note: This section is seen in the end of nanjIyar‘s overall introduction. In the first thiruvAimozhi (decad), nammAzhwAr by the divine mercy of emperumAn fully visualizes bhagavAn as the complete personality (in svarUpam (true nature), rUpam (forms), guNam (auspicious qualities), vibhUthi (wealth)), sarvEswaran (the controller of every one), sriya:pathi (the divine consort of srI mahAlakshmi) and the one who is revealed through vEdham which is glorified as apaurushEyam (not written by an individual) and most authentic scripture. Having experienced that, being overwhelmed with bliss out of that experience, he speaks about the same and instructs his heart/mind to serve the lotus feet of such glorious bhagavAn. Just like a person who first sees (researches) an ocean will subsequently analyse each wave, gem that is found in the ocean, etc., that are found in the ocean, AzhwAr enjoys those qualities which are collectively in the first decad in a more detailed manner in the subsequent decads. AzhwAr is not the first one to follow this method – vAlmIki, vyAsa, etc., who are the authors of srI rAmAyaNam, mahAbhAratham, etc., respectively have also pursued this approach of first explaining something in short and subsequently in great detail. Note: This section is seen in the end of vAdhi kEsari azhagiya maNavALa jIyar‘s overall introduction. nammAzhwAr highlights the supremacy of bhagavAn in this first thiruvAimozhi (decad). In the 1st pAsuram (verse), bhagavAn’s vilakshaNa guNam (unique qualities), vibhUthi (wealth) and vigraha yOgam (divine forms) are explained. In the 2nd pAsuram, bhagavAn‘s vilakshaNa svarUpam (unique nature) on which the previously explained aspects are anchored/resting is explained. In the 3nd pAsuram, his endless relationship with this material world is explained. In the next 3 pAsurams it is explained that – all sentients and insentients that are within this material world wholly depend on bhagavAn for their nature, existence, actions, etc. In the 4th pAsuram it is explained that all entities are by nature dependent on bhagavAn per sAmAnAdhikaraNyam (sarIra/sarIri bhAvam – everything having bhagavAn as the common substratum). In the 5th pAsuram, it is because of vaiyadhikaraNyam (being distinct from everything else) he protects every one by supporting in their existence is explained. In the 6th pAsuram, again per sAmAnAdhikaraNyam he controls all actions of all entities. In the 7th pAsuram, the sarIra-Athma sambhandham is explained. In the 8th pAsuram, it is explained that there is no other Iswara (controller) than bhagavAn himself. In the 9th pAsuram, concepts which are explained by avaidhikas (ones who do not accept vEdham as authority) are refuted clearly. In the 10th pAsuram, bhagavAn‘s vyApakathvam (omnipresence) is explained. In the 11th pAsuram, bhagavAn being the master of everyone/everything is explained to establish his supremacy over everything else. Note: This section is seen in the end of periyavAchchAn piLLai‘s overall introduction. In addition to what is explained by nanjIyar, periyavAchchAn piLLai also highlights some beautiful aspects. He highlights the meaning of the first pAsuram of thiruvAimozhi nicely. That is “bhagavAn who is opposite to all defects and the abode of all auspicious qualities, having divine form which manifests such divine qualities, being the master of srI mahAlakshmi, being the master of nithyasUris who enjoy these wonderful aspects of him in paramapadham, out of his unlimited mercy, ignoring my defects, out of unconditional grace and great attachment towards me, dispelled my ignorance completely and blessed me great knowledge and devotion towards him. Thus, I shall now serve his lotus feet and be uplifted”. Saying this, nammAzhwAr attempts to engage in the loving service to emperumAn. 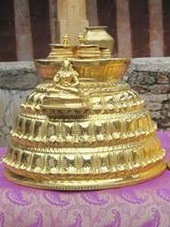 From this we can see that, in the beginning of the prabandham itself, the establishment of the object of the glorification (sudaradi – the glowing lotus feet of emperumAn) as well as bowing down reverentially (thozhuthu ezhu) are present.